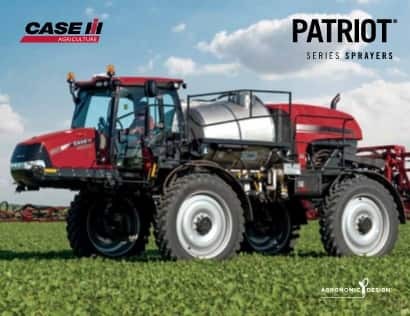 Experience the accuracy and consistency of Patriot series sprayers on a new level: Advanced Farming Systems (AFS) AccuTurn is now available on Model Year 2019 Patriot® series sprayers through the AFS Pro 700 display. Using precise automatic turn-path planning, AFS AccuTurn removes guesswork, allowing you to deliver quality application and cover every inch of ground. For Case IH Viper 4+ display users, the alternate RS1™ high-speed guidance and steering system is available. Easily-installed crop shields split crops in fields that don’t have true rows to make passes in, or in fields of row crops that have canopied over, protecting your yields. AFS AccuTurn automated headland-turning technology provides hands-free, automatic and repeatable turns for increased productivity. Optional automated rinse feature allows you to start the rinse cycle, either from the service center or in the cab, with the click of a button, helping to reduce fatigue and increase productivity. Optional active suspension replaces the front shock absorbers with hydraulic cylinders. The hydrostatic cylinders monitor drive pressure and in the event of low traction the cylinder collapses the suspension spring to bring the front end down to keep traction. Choose the optional single camera selection on your sprayer to easily monitor center-section-mounted spray nozzles from the cab. Add two additional cameras for visibility of the boom-mounted nozzles you can’t see otherwise. If desired, cameras can be mounted in a variety of locations to monitor traffic during transport, watch your tires while traveling down the field rows or monitor other customer-preferred views. Time spent on maintenance is time away from the field. 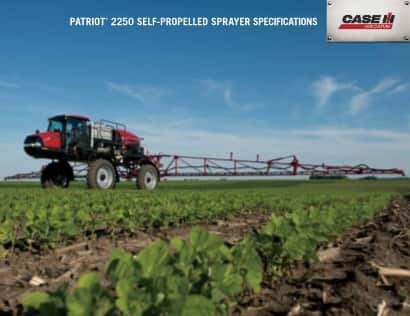 Patriot sprayers feature a one-stop service center that lets you perform all tendering functions from a single location. Connections are provided to make it easy to fill tanks from ground level, and an optional fill flow meter allows you to see exactly how much is going into the main tank. Large plumbing hoses, newly improved direct hose routings and minimal fittings and connections are standard, making tank fill time shorter, and service easier than ever before. Case IH Patriot sprayers are designed to get maintenance out of the way quickly and efficiently... and get you back in the field ASAP. ​Easily convert your self-propelled sprayer into side-dress fertilizer machine to ensure your crops get nitrogen when they need it most. ​Lightweight, durable aluminum drops let you outfit full booms with less structural stress. Featuring an 800 gallon product tank, the Patriot 3240 delivers the right rate not only across the entire boom, but also the entire field. The Patriot 3340 is built to last. The 3340 offers boom width options from 60 to 120 ft and has a 1,000 gallon stainless steel product tank. With its 140 gallon fuel tank and 1,200 gallon product tank, the Patriot 4440 keeps you in the field for a full day of spraying. 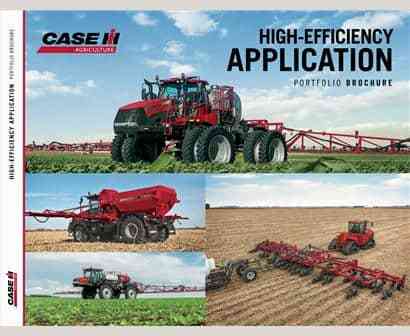 From application tips to the latest spraying technology, subscribe to the Case IH Blog for timely sprayer topics that will help you make the most of every tankful. ​Configure and price your new Patriot Series Sprayers. Customize it the way you want.